This article originally appeared in the Homer Tribune. Imagine hovering in a helicopter above Grewingk Glacier Lake, in Kachemak Bay, fifty years ago. From this safe vantage, you watch as 80 Empire State Buildings worth of material, slowly dislodge from the steep slope above the lake, and then let go all at once. Cleaved from the surface, you see the unfathomable volume of material gain momentum. By the time the deafening roar reaches your ears, the 110 million cubic yards of rock has thundered into the lake, sending a wave hundreds of feet into the air. Craning your neck, you watch this fast moving bulge of water slosh over the outwash plain, uprooting alders and mature trees, carrying everything in its path all the way to Kachemak Bay, more than four miles distant. You just witnessed a suite of natures most destructive and incredible phenomena—a landslide generated tsunami. This may seem like a crescendo scene from an apocalyptic Hollywood movie, but last October marked the fifty-year anniversary of the Grewingk landslide and tsunami. No helicopter hovered in the air and thankfully no one was in the valley that day. However, many in Homer and nearby Halibut Cove heard the crash and later witnessed glacier ice in Kachemak Bay. Homer residents were able that fall to salvage trees for firewood that washed ashore onto the Homer Spit. This event has captured the attention of two local geologists, who worry another landslide and tsunami could occur in the same area with similar, or worse, devastation. Throughout coastal Alaska, landslides, some of which have caused massive tsunamis, are occurring with increased frequency. Steep mountain valleys, fjords, and bays that have, for many thousands of years, been full of glaciers have seen rapid retreat over the last fifty years. This has led to slope instability in many areas. Glaciologists and geologists call this process, glacial debuttressing. In June, Berg, Higman and the American Packrafting Association organized a human-powered research expedition to Grewingk Glacier Lake, hiking over the trail with a flotilla of packrafts and some low-budget tools. One of the goals of the group was to better understand the depth of the lake. This information is key to understanding the potential for another tsunami. For the trip, Berg engineered a simple 1x4 contraption, which he affixed to the stern of his packraft. From this device he mounted a borrowed sonar fish-finder to measure and record the lake bottom depth profile. Others in the party used less sophisticated instruments to measure lake depth from the platforms of their packrafts, like a handheld sonar depth gauge or weighted lengths of string. The deepest spot the team discovered—490 feet—was near the glacier face and the average depth below the potential landslide slope averaged 360 feet. “We were surprised that the lake is so deep,” said Berg. For a landslide tsunami, deeper water means greater hazard. The entire volume of the landslide could end up beneath the water‘s surface—creating a much bigger wave. Deeper water absorbs more of the landslides energy, converting it into a bigger, more powerful wave. 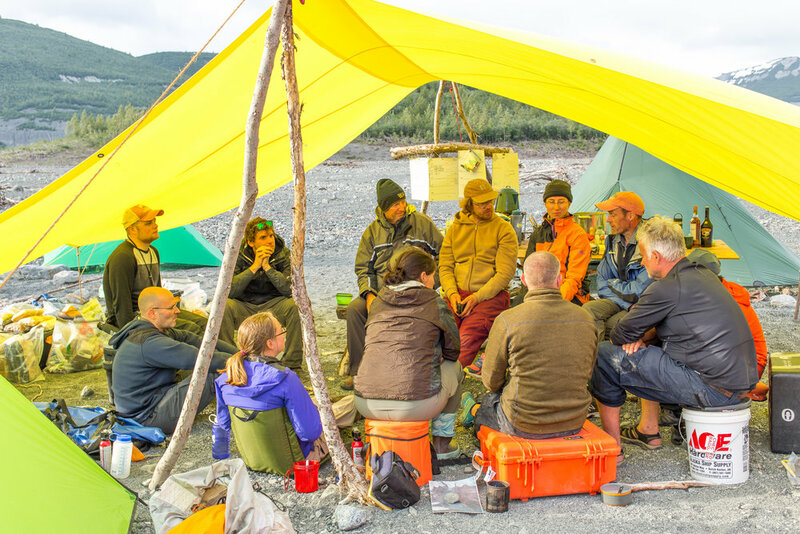 Thus far, Berg and Higman have been aided with small equipment loans and organizational support from the American Packrafting Association but the two are working without funding or institutional backing. Statistically speaking, there is no good reason not to visit Kachemak Bay State Park’s magnificent treasure, the Grewingk Glacier. It’s not advisable to camp on or near the lakeshore but the likelihood of a cataclysmic event occurring during a day hike through the park is quite low. No one can predict when or even if there will be another landslide and tsunami. As our climate continues to warm, the research and study of these interconnected phenomena is wildly important—as important, perhaps, as visiting an Alaskan glacier. Wind is an Alaskan natural resource we let slip through our fingers. This article was originally published by Alaskans Know Climate Change and the Anchorage Press. An elegant proposal to transform Alaska’s Rail-belt to 100% renewable energy. Just after sunrise, the icy hoar frost clinging to the willow branches in the Tanana River Valley begin to shudder. At first, the wind comes in a light zephyr. Branches lazily sway; a few ice crystals lose hold and fall from their perch, catching the rosy dawn light, making the morning air sparkle. Within an hour’s time, a powerful gale is blowing. The air fills with fine, crystalline powder and snowdrifts form on the leeward side of every bump and rise. The wind will not stop for weeks. All the critters in the valley will forget that there was ever a time when the world didn’t scream and hurt. 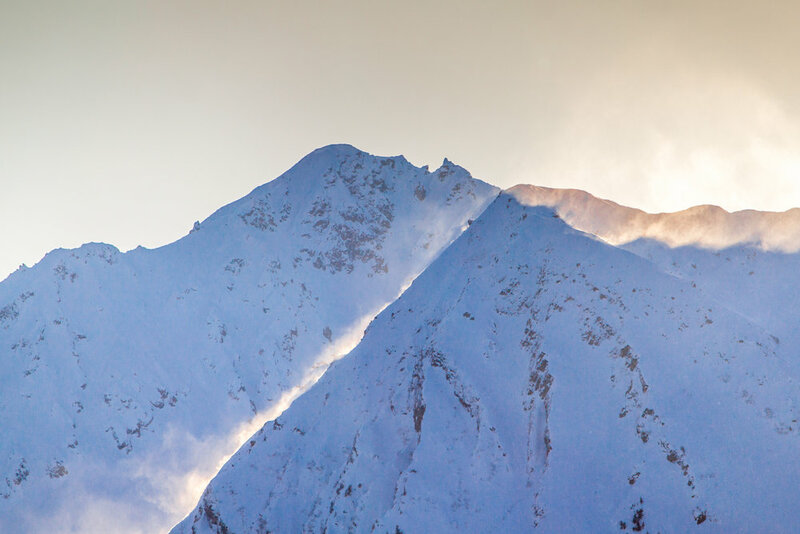 Wind is an Alaskan natural resource that, for the most part, we let slip through our fingers. Daily, billions of kilowatts worth of energy whoosh and rush through our valleys, down our fjords and off our mountain peaks—untapped, and unrealized. What if we could harness that power? What if every Alaskan home had so much cheap energy that we could heat our homes with electricity, charge our cars and trucks with electricity, light our streets, power our schools, public buildings, and illuminate brilliant minds set on making Alaska a better place for future generations? What if our power came from wind that doesn’t become more or less expensive because of the whimsy of distant market forces? Cheap, consistent, reliable wind is what Alaska has in abundance. What if we tapped into it? Tucked into a hill, up the Eagle River Valley, in an unfinished, three story home, a 66 year old retired engineer, and life-long Alaskan, has developed a plan to save Alaska, fight climate change, and solve our energy problems—for the next several hundred years. For months, Kerry Williams has sat in front of his computer screen crunching numbers, using his sophisticated CAD software, creating Google Earth maps, and researching a bold and visionary concept. For months, Kerry has been slapping his forehead. His idea, on the face of it, is so simple it hurts. “I’m always assigning myself difficult but entertaining problems to solve in my spare time, as a hobby.” Kerry says. “When I retired fifteen years ago, I decided that the problem that most needed solving was how to get Alaska’s post-oil economy stabilized.” No small task. But for someone with 4 standard deviations above the normal IQ and an active member of several international high IQ organizations, for Kerry, this is just another day in the life; another challenge to be met. Alaska is rife with alternative energy potential—wind, solar, geo-thermal, tidal, and biomass are all here, in abundance. However, one challenge to integrating renewable energy into the grid is what to do about the inherent variability of renewables? What do you do when the wind stops and the clouds obscure the sun? How do you store that energy in times of abundance? A battery. You need a really big battery, and this is where Kerry’s idea picks up. This is where Kerry believes he has found a solution so simple it is elegant. “I was recently looking closely at the possibility of developing and exporting some very concentrated renewable energy resources in central and northern Alaska.” Kerry tells me. “Variable Renewable Energy (VRE) requires some method of evening out the energy for transmission and integration into the grid. There are three methods of doing that,” he says. A team of dedicated alternative energy experts—including Kerry and his partner Ceal Smith— have been studying this issue for the last several years and have come up with the Alaskan Roadmap to 100% renewable energy for the entire state. For Alaska’s rail-belt, widely separated sources of alternative energy, on the face of it, should not be a problem. Wind farms on Fire Island and in the Tanana River Valley, Cook Inlet tidal, Kenai Peninsula solar, etc., etc. However, it is the final method of leveling the Variable Renewable Energy that has most captured Kerry. Sounds too good to be true? How does it work? This plan proposes to build a 6000 acre-feet freshwater reservoir below East Twin Peak, on the south bank of the Knik River. The massive Knik Glacier and its river is capable of providing large volumes of water and because of the glaciers massive size and geographical location, it is not in danger of going extinct because of global warming anytime soon. The next thing to focus our most talented engineering minds on is the study of Kerry’s proposed high elevation impounds, e.g. dams, above Eklutna Lake and then building them. Kerry has identified five ideal, high elevation valleys, which are perfect locations for enough high altitude water energy storage to light, heat, and drive the entire railbelt for months. By pumping water up to these reservoirs, through tunnels in the mountains, when there is surplus energy, this project would be an energy savings account—a literal rainy day fund. Talking with Kerry, several things jump out to me. As a fellow life-long Alaskan, I have come to take it for granted that Alaskans are quite often modern day Renaissance women and men—handy and capable in numerous and often widely divergent skill-sets. The ability to swap a transmission out of a Ford F-150, design and build a home, develop a website, weld a bicycle frame back together, hunt, fish, and grow a garden, and play Bach on a classical guitar, for example, is just who we are. We also do not know how to take no for an answer. When there is a problem in front of us, Alaskan’s get to work and fix the goddamn thing—whatever it is. Throughout his working years, Kerry has accumulated a robust construction background including large projects, like TAPS, some oil field, flood control projects, harbors, energy project research, design and consulting in solar, wind, electric transportation, and geothermal projects and has been Chief engineer on an electric vehicle project. But something unique about Alaskans is that when we are asked, “What do you do?” we often don’t highlight how we make money. What we do is what inspires us and how we want others to think of us. For Kerry, many years of hiking, biking, skiing, hang-gliding, photographing, paragliding, fishing, and many other activities within Chugach State Park have given him a great appreciation for the place, a sense of identity and a strong desire to care for and enhance the natural attributes to the best of his ability. Kerry currently lives within walking distance of the Park and has a deep reverence for the natural environment of his backyard and the state as a whole. Kerry is an environmentalist. In 2009, then Governor, Sarah Palin, understood the threat climate change was having on our state. Alaska is warming twice as fast of the rest of the nation and four times faster in winter because our civilization produces an additional 40 billion tons of greenhouse gases every year. This increase in greenhouse gases is also disproportionately acidifying our seas. Roughly 30% of those greenhouse gases come from our global energy demands—coal, oil and natural gas power plants. Governor Palin set a mandate* that Alaska would, by 2025, provide half of its energy needs from renewables. If we get to work, Kerry’s plan could shatter this goal. It is clear, after spending time with Kerry, asking lots of questions, looking at his Google Earth mock-up, and trying to stump him with my inquiries, that it is time for his project to leave the nest. What this proposal needs now is an army of smart people to rip it apart, find the flaws, improve on it—what this project needs now is peer review and investment. What would rate payers pay per kilowatt-hour, I asked him? Without flinching, he has an answer and I realize, again, I am in the presence of someone way, way smarter than me. “After we’re at 100%” he has calculated, “and have paid off the bonds, it should drop to around $0.08 kWh, except for homeowners and businesses who cover their roofs with solar panels. They would pay considerably less, or even profit if they generate more than they use.” That’s less than a penny! Right now, MEA customers pay about $0.20 kWh, and Golden Valley members pay $0.21. “I’ve already talked with a few of the stakeholders whom I would expect to have the most relevant expertise and pointed criticisms, and so far they’ve been encouraging,” he tells me. “Rick Sinnot, whose study and article about Eklutna Salmon* was the trigger; Marc Lamoreaux, Eklutna Village environmental director; Debra Lnne, Tanana Chief Conference natural resources director—about their potential wind resources to ‘charge’ the Eklutna Complex—and her Tanana Chiefs Conference colleague who owns a lease on the potential lease site; also, Ed Zapel, Senior Hydraulic Engineer for HDR, who understood my project instantly. They all seemed quite interested. I still need to talk with AEA personnel and CIRI wind personnel,” he tells me. As far as I know, there has never been a study within Alaska, which looks at the potential for large, man-made reservoirs to produce methane, which is a more potent greenhouse gas than carbon dioxide. In temperate regions, where reservoirs are built in valleys, which contain a lot of biomass, methane is produced. Whether or not man-made, large volume water impounds within Alaska would produce this greenhouse gas is yet to be seen. But Kerry’s proposal has almost zero chance for methane production; the reservoirs are all within recently glaciated, high alpine zone, with low biomass. Environmentalists are often called C.A.V.E. people—Citizens Against Virtually Everything. My retort to that is, “Show me a project that works with the natural world rather than despoils it for short-term profit.” This is a mega-project that all Alaskans, regardless of political affiliation, can get behind. For as long as I can remember, we have been offered a phony dichotomy: we can choose—the thinking goes—between either a healthy environment,or jobs and a robust economy. This notion is poppycock! Kerry’s proposal would, in his words, “…provide two to four times as much as we need to power everything from Fairbanks or Tanana, Anchorage, to Homer.” This mega-project would provide countless construction jobs and long-term maintenance jobs. Furthermore, Alaska would become an incredibly attractive place for business to invest. Imagine Internet companies buying our cheap renewable energy and using glacier air to cool their massive servers. But I digress. It is time to come together as Alaskans to fight climate change, defend our way of life and embolden the industries of the future. Kerry Williams and his pumped hydro project is a part of that future and, like the wild of Alaska, it is calling us to action. Watch a short video with Kerry Williams discussing the Eklutna Pumped Hydro project. For more information about this project please visit Alaskans Know Climate Change. This article originally ran in Alaska Magazine. On October 17, 2015 a mountain at the head of Taan Fjord, an arm of Icy Bay, Alaska broke in half and crumpled under its own weight. Some 200 million metric tons of material came crashing down in what must have been a deafening roar. Some of the rock slid onto the snout of a tidewater glacier but most slid into the head of Taan Fjord – displacing a massive volume of water. This landslide-generated tsunami had a maximum height of over 600 feet. The wave traveled down the fjord, dislocating sediment and scouring forest for over ten miles. JUNE 2016: From the foredeck of the MV Seawolf, an aluminum six-pack charter boat, I turn to see Scott Chadwick, the burly Yakutat boat captain, look nervously from his depth sounder to the slowly approaching shore. Chocolate syrup water in the silty glacial fjord obscures hidden rocks. My eyes are peeled; ready to yell stop at the first sign. The bow grinds against the shoreline and gently makes contact. Perfect. The look of apprehension on the captain’s face is gone and I, along with four earth-scientists, disembark. On land, the five of us create a gear-chain and hand scientific equipment and my camera gear up the steep and unstable edge of the shore. Directly across the bay is the massive, cleaved-in-half mountain. The boulders and gravel under my feet had traveled over a kilometer from somewhere within that mountain and were deposited here in a feat of unimaginable violence. “Sometimes geology isn’t slow,” Bretwood Higman, one of the scientists observes. My task is to document what the “crime investigators” learn about the Icy Bay landslide-generated mega-tsunami - to tell their story of geologic and hydrologic discovery. After shooting video from the shore we wave goodbye to Scott, who will spend the day fishing, while we walk up the valley to find the high watermark of the tsunami. Landslide tsunamis have happened in Alaska before. Most notably was the 1958 Lituya Bay landslide and tsunami, which created a wave 1720 feet high – the highest wave ever recorded. What is unique about the Icy Bay landslide and tsunami is that scientists are able to study it so soon and with a suite of state of the art equipment. Alaska’s rapidly warming climate – twice that of the global average - is related to this catastrophe. Icy Bay was as recently as the early 1960s filled with glaciers to the mouth of the bay with ice as thick as 1000 feet. This rapid de-glaciation and de-buttressing of the hill slopes is at least part of the reason for the instability, which led to the landslide. Other areas of Alaska and Norway are experiencing similar phenomena much nearer to tourist destinations and communities. After gaining 600 feet of elevation in our mile-long hike, I take off my backpack and drink a long slug of water. The day is warm and we’ve all sweat under our loads. We are standing at the trim-line where the rush of water scoured the brush and left only bare rock. The team looks for evidence of broken branches or out of place sediment above the line – trying to locate the absolute highest run-up. They finally make the call – 187 meters, or 613 feet. I turn around and face the fjord. The charter boat, anchored in the middle, is now a tiny dot below us. Directly behind the boat is the cleaved mountain. I try to imagine the force, the violence, and I come up short. Geology may not always be slow; thankfully it usually is. Watch the film, Icy Bay Mega-Tsunami.